11th lunar month of 1716: first-recorded performance in Ôsaka at the Higashi no Shibai in the kaomise drama "Futahashira Kasen Kagami", which was produced by Arashi Sangorô I. 11th lunar month of 1717: Hanamatsu performed in Ôsaka at the Kado no Shibai in the kaomise drama "Benten Chôja Uga no Tama", which was produced by Ogino Kinnojô. 11th lunar month of 1718: Hanamatsu performed in Ôsaka at the Higashi no Shibai in the kaomise drama "Kogane no Seigaiha", which was produced by Arashi San'emon III. 1st lunar month of 1719: Hanamatsu's rank in the Ôsaka hyôbanki, wakaonnagata section, was naka-no-jô (superior in the middle class). 11th lunar month of 1719: Hanamatsu performed at the Naka no Shibai the role of Ikomanojô in the kaomise drama "Onna Daimyô Iroha Obi", which was produced by Takeshima Kôzaemon II. 1st lunar month of 1720: Hanamatsu's rank in the Ôsaka hyôbanki, wakaonnagata section, was (shiro)jô ((white) superior) [visual]. 11th lunar month of 1720: Hanamatsu performed at the Kado no Shibai in the kaomise drama "Hana Yakata Chibikizuru", which was produced by Kirinoya Gonjûrô I. 1st lunar month of 1721: Hanamatsu's rank in the Ôsaka hyôbanki, wakaonnagata section, was jô (superior) [visual]. 11th lunar month of 1721: Hanamatsu played at the Naka no Shibai the role of Umekawa in the kaomise drama "Onna Genji Musha Sugoroku", which was produced by Takeshima Kôzaemon II. 11th lunar month of 1722: Hanamatsu played at the Naka no Shibai the role of Usugumo in the kaomise drama "Odori Hotei", which was produced by Takeshima Kôzaemon II. 1st lunar month of 1723: Hanamatsu's rank in the Ôsaka hyôbanki, wakaonnagata section, was jô (superior) [visual]. 3rd lunar month of 1723: Hanamatsu's rank in the Ôsaka hyôbanki, wakaonnagata section, was jô-jô (superior-superior) [visual]. He shared the same rank with Izumikawa Sennosuke. 11th lunar month of 1723: Hanamatsu played at the Naka no Shibai the role of Tamakazura in the kaomise drama "Chûshin Futaba no Matsu", which was produced by Matsushima Hyôtarô. 1st lunar month of 1724: Hanamatsu played in the same theater the role of Ôtô-no-Miya in the drama "Ôtô-no-Miya Asahi no Yoroi". 11th lunar month of 1724: Hanamatsu played at the Ônishi no Shibai the role of Ozasa in the kaomise drama "Senbon Matsu Hi-no-De no Maizuru", which was produced by Sakakiyama Shirotarô I and Sawamura Kiyojûrô. 11th lunar month of 1725: Hanamatsu performed at the Kado no Shibai in Kaneko Kichizaemon's kaomise drama "Wagô no Futabashira", which was produced by Arashi San'emon III. 1st lunar month of 1726: Hanamatsu's rank in the Ôsaka hyôbanki, wakaonnagata section, was one black stroke below jô-jô (superior-superior) [visual]. Hanamatsu performed in the same theater in the new year ni-no-kawari drama "Keisei Asama-ga-Dake" which was staged to commemorate the 20th and 9th anniversaries (19th and 10th memorial services) of the passing away of Nakamura Shichisaburô I and Yamashita Kyôemon I. 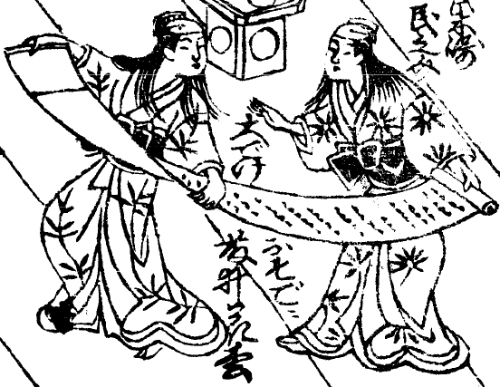 11th lunar month of 1726: Hanamatsu became zamoto and produced at the Kado no Shibai the kaomise drama "Bunbu Aioi no Matsu", which celebrated the shûmei of Fujikawa Hanzaburô II. 3rd lunar month of 1726: Hanamatsu's rank in the Ôsaka hyôbanki, wakaonnagata section, was back to jô-jô (superior-superior) [visual]. 11th lunar month of 1727: Hanamatsu performed at the Ônishi no Shibai in the kaomise drama "Watamashi Yatsumune Gura", which was produced by Sawamura Otoemon I. 11th lunar month of 1728: Hanamatsu performed in Ôsaka at the Kado no Shibai in the kaomise drama "Aioi Chôja Sangai-gura", which celebrated the shûmei of Yagi Niemon and Arashi Sanjûrô II. 1st lunar month of 1729: Hanamatsu's rank in the Ôsaka hyôbanki, wakaonnagata section, was jô-jô-(shiro)hankichi (superior - superior - (white) half excellent) [visual]. 11th lunar month of 1729: Hanamatsu performed at the Kado no Shibai in the kaomise drama "Banzai Kogane Tsukuri", which is produced by Arashi Sanjûrô II; his stage partners are Nakayama Shinkurô I, Yoshizawa Ayame II, Kirinoya Gonjûrô I, Yamashita Kinsaku I, Nakamura Sôjûrô and Sakurayama Shirosaburô I. 11th lunar month of 1730: Hanamatsu performed at the Kado no Shibai in the kaomise drama "Matsukane Fukki no Ishizue", which was produced by Sadoshima Chôgorô I. 3rd lunar month of 1731: Hanamatsu's rank in the Ôsaka hyôbanki, wakaonnagata section, was jô-jô-(shiro)kichi (superior - superior - (white) excellent) [visual]. 11th lunar month of 1731: Hanamatsu played at the Kado no Shibai the role of the keisei Naniwazu in the kaomise drama "Aioi Kikenjô", which was produced by Arashi Kokuseki. 3rd ~ 4th lunar months of 1732: Hanamatsu played in the same theater the roles of Princess Minazuru and Asuka in the drama "Kiichi Hôgen Sanryaku no Maki" [more details]. 11th lunar month of 1732: Hanamatsu played the role of the keisei Yoshino in the kaomise drama "Mitsu no Hama Kogane no Irie", which was produced by Arashi San'emon III at the Kado no Shibai. 1st lunar month of 1733: Hanamatsu's rank in the Ôsaka hyôbanki, wakaonnagata section, was two black strokes above jô-jô-(shiro)kichi (superior - superior - (white) excellent) [visual]. 11th lunar month of 1733: Hanamatsu played at the Ônishi no Shibai the role of Tomoemon's nyôbô Onui in the kaomise drama "Shigeri Matsu Kogane no Takaragura", which was produced by Nakamura Jûzô I (who played the role of Shikizu Tomoemon). 1st lunar month of 1734: Hanamatsu's rank in the Ôsaka hyôbanki, wakaonnagata section, was jô-jô-(hanshiro)kichi (superior - superior - almost excellent) [visual]. He shared the same rank with Izumikawa Sennosuke. 11th lunar month of 1734: Hanamatsu performed at the Ônishi no Shibai in the kaomise drama "Asahi no Matsu Kogane no Shinbashira", which was produced by Nakamura Jûzô I. 11th lunar month of 1735: Hanamatsu played at the Kado no Shibai the role of the keisei Hinazuru in Sadoshima Saburôzaemon's kaomise drama "Ôyamato Kane no Kinzan", which was produced by Nakayama Shinkurô I. 11th lunar month of 1736: Hanamatsu played at the Ônishi no Shibai the role of Oume in the kaomise drama "Banshû Onna Narihira", which was produced by Yoshizawa Ayame II. 11th lunar month of 1737: Hanamatsu played at the Ônishi no Shibai the role of the mekake Otsuru in the kaomise drama "Uta Kurabe Kachidoki no Ume", which was produced by Yoshizawa Ayame II. 11th lunar month of 1738: Hanamatsu played at the Naka no Shibai the role of Jûnai's nyôbô Ozasa in the kaomise drama "Fuji Daiko Wagô no Shirabe", which was produced by Arashi Sangorô I; the role of Wada Jûnai was played by Fujioka Daikichi. 11th lunar month of 1739: Hanamatsu performed at the Naka no Shibai in the kaomise drama "Fûryû Gozen Kabuki", which was produced by Sanogawa Hanazuma II. 11th lunar month of 1740: Hanamatsu played at the Kado no Shibai the role of Yodogorô's mekake Osode, in reality Sekinai's nyôbô, in the kaomise drama "Hanaikusa Nishiki no Manmaku", which was produced by Nakamura Jûzô I. Fall 1740: Hanamatsu went to Kyôto. 1st lunar month of 1741: Hanamatsu's rank in the Ôsaka hyôbanki, wakaonnagata section, was two black strokes above jô-jô-(hanshiro)kichi (superior - superior - almost excellent) [visual]. 11th lunar month of 1741: Hanamatsu played in Kyôto the role of Kuzu-no-Ha in the kaomise drama "Imayô Shinoda Zuma", which was produced at Miyako Mandayû's theater by Nakamura Kumetarô I. 1st lunar month of 1742: Hanamatsu's rank in the Kyôto hyôbanki, wakaonnagata section, was two three strokes above jô-jô-(hanshiro)kichi (superior - superior - almost excellent) [visual]. 2nd lunar month of 1742: Hanamatsu played in the same theater the roles of Gontarô's nyôbô Ogin and Kazue's nyôbô Naruse in the san-no-kawari drama "Keisei Nagusa Gôri"; the roles of Gontarô Yoshimitsu and Shibata Kazue were played by Sakakiyama Shirotarô I. No record afterwards. Fujii Hanamatsu was an Ôsaka onnagata actor, who was active from the second half of the 1710s to the beginning of the 1740s. He was outstanding in keisei or mekake roles. He disappeared from the records when he was really close to become a jô-jô-kichi actor.